Hindus aren't the only ones annoyed by Smite's portrayal of the goddess Kali. A few weeks ago we learned that the Universal Society of Hinduism is a bit annoyed at the portrayal (and playable nature) of Hindu deities in upcoming gods-based MMO outing Smite. 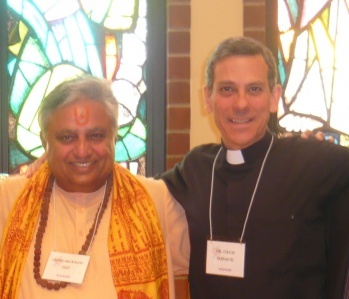 The Universal Society, led by President Rajan Zed (pictured, left), alleges that the inclusion of Hindu deities such as Kali "trivializes" the standing of these Supreme Beings in an unacceptable way. In a pleasant example of inter-faith cooperation, a Roman Catholic leader from Nevada has now urged that spiritual people come together to stop Smite from making a mockery of divine beings. The Nevada-based leader in question, Father Charles T. Durant (pictured, right), is very clear on where the nation's believers should stand in this debate. "Respect for religious practice and beliefs is a basic tenet of our land," he said in a statment. "When using religious images in commercial media basic respect calls for understanding the teachings behind those images. This need is only heightened when using a religion's supreme images. I would hope that understanding and respect will bring a mutual agreement honoring these Hindu concerns," concluded Durant. In addition to this, the Universal Society reports that it has also received support from an American Rabbi, who called on Smite developers Hi-Rez Studios "to avoid trivializing the deeply held beliefs of Hindus by changing the product accordingly." Commenting on the issue, Buddhist Reverend Jikai' Phil Bryan added, "Shame on the game-makers for denigrating these Supreme Beings." Hi-Rez Studios has yet to comment on the issues beyond saying that Smite will continue to expand its use of religious pantheons once it escapes it current beta status. It's an interesting debate: Does the fact that a game reverses the virtual relationship between believers and their gods mean that it is inherently disrespectful? Will players actually learn anything useful about various faiths from such games? Time will tell, but for the moment, the Universal Society of Hinduism and its multi-faith friends know exactly where they stand.